Learn how to use add-ons or extensions in Dreamweaver to reformat tables, connect to back-end databases, or help you write scripts for browsers. Add-ons or extensions are new features that you can add easily to Dreamweaver. You can use many types of add-ons; for example, there are add-ons that let you reformat tables, connect to back-end databases, or help you write scripts for browsers. To install add-ons that all users have access to in a multiuser operating system, you must be logged in as Administrator (Windows) or root (Mac OS X). For more information on using Dreamweaver on multiuser systems, click here. The Adobe Add-ons page lists all the add-ons that you can install and use with Dreamweaver. You can also install the add-ons easily from the Add-ons page. Click Windows > Extensions > Browse Extensions to browse and install add-ons. 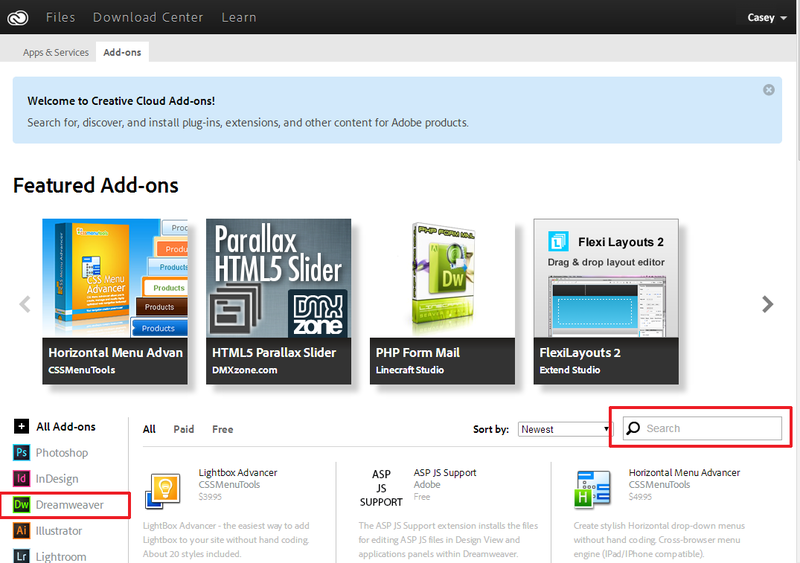 When you click Browse Extensions, the Adobe Creative Cloud Add-Ons page appears. 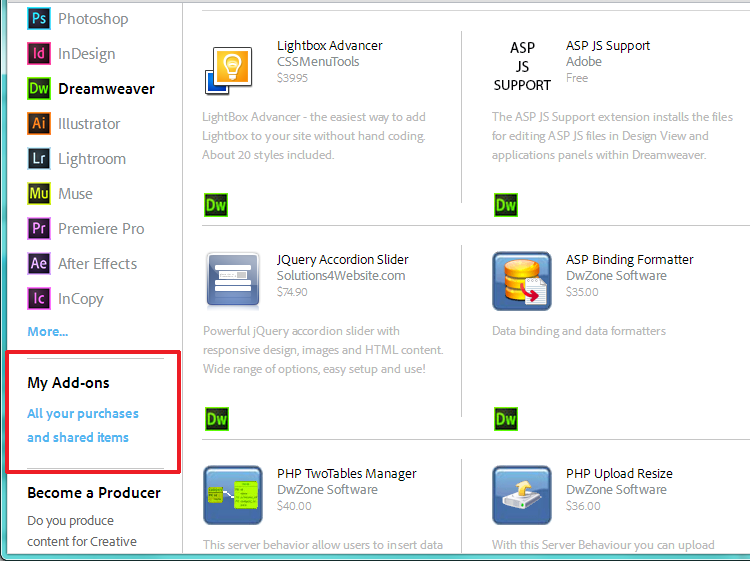 On the Adobe Creative Cloud Add-Ons page, click Dreamweaver on the left to view Dreamweaver-specific add-ons. You can also use the search box on the right to search for a specific add-on. 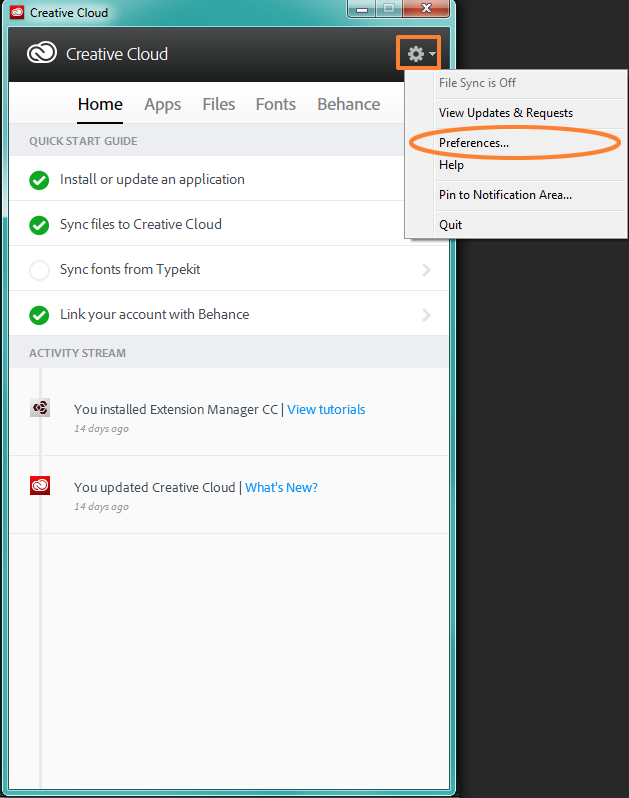 Important: Before installing add-ons, ensure that you have enabled file sync for your Adobe Creative Cloud account. 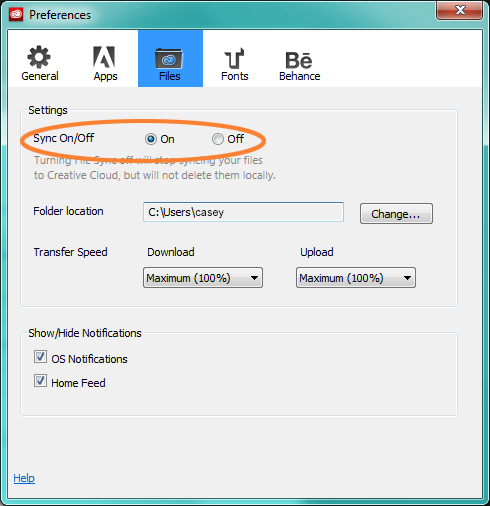 See Enable file sync on Adobe Creative Cloud for more details. Follow the on-screen instructions to install the add-on. To view the add-ons that you have installed or shared, click All Your Purchases And Shared Items under My Add-Ons. Before installing add-ons from Adobe Creative Cloud, ensure that you enable file sync through your Adobe Creative Cloud client. Click on your system tray to open the Adobe Creative Cloud client. Click , and then click Preferences. In the Files tab, set Sync On/Off to On. Most times, an add-on is built to work with a specific version of Dreamweaver, mostly the latest version. The add-on can be used with later versions of Dreamweaver too, if it is built or configured to be used across Dreamweaver versions. When you install a new version of Dreamweaver and the previous version is uninstalled, the add-ons too are uninstalled. In such cases, the Adobe Creative Cloud desktop app automatically installs the add-ons that you have acquired (from the Add-ons page) while installing the new version of Dreamweaver. After the add-ons are installed, the Creative Cloud desktop displays a notification to indicate that the installation is successful. The only thing that you have to ensure is that the file sync option in the Creative Cloud desktop app is enabled for the automatic installation of add-ons. Note: Only those add-ons that are compatible with the new version of Dreamweaver are installed by the Adobe Creative Cloud app. Third-party extensions can be installed through ZXP files using the Exman command line tool. If you do not have the ZXP file with you, contact the company selling the extension. Ensure that the extension is supported on the version of the application on which it is being installed. Download the ZIP file for the ExMan Command Line tool from http://www.adobeexchange.com/ExManCmd_win.zip. Download the ZXP file, and copy it to the same location. In this example, the ServerBehaviorDatabase_1_0_0.zxp file is copied to this location. Run the command line tool as an administrator. Right-click the command line application and select Run as Administrator. Close the application related to the extension before you proceed with the installation. In the command prompt, navigate to the folder containing your extracted files. In our example, the location is C:\Exmancmd_Win. To navigate to this location, run the command cd C:\Exmancmd_Win. When using the command line tool, ensure that you maintain case for the letters that you type. To install the extension, run the command ExManCmd.exe /install .zxp. To troubleshoot errors during installation, see this article. To verify the extension being installed, run the command ExManCmd.exe /list all. Open the application related to the extension, and follow instructions in the user guide to locate the extension. Ensure that you open the correct version of the application. Similar to Windows OS, you can install extensions using the Terminal application on Mac OS. Ensure that you maintain case for every command. Download the ZXP file, and place a copy on the desktop. Download the ZIP file for ExMan Command Line Tool from http://www.adobeexchange.com/ExManCmd_mac.zip. Extract the contents of the downloaded ZIP file. Copy the Contents folder to the Desktop. Open Finder. Select Application > Utilitiies, and double-click Terminal. Enter cd ~/Desktop to navigate to the Desktop. Run the command ./Contents/Mac OS/ExManCmd --install .zxp to install the extension. If you run into permission issues, you can run the command using elevated privileges. Prefix sudo to the command. For example, in this case, use sudo ./Contents/Mac OS/ExManCmd --install .zxp. Enter password at the prompt and press Enter. It is possible that you do not see the cursor moving or the text being entered as you type.